Website self-service is a magical idea. Your online customers have questions, your site provides answers, and you never answer the same question twice. Easy, right? In practice, not so much. 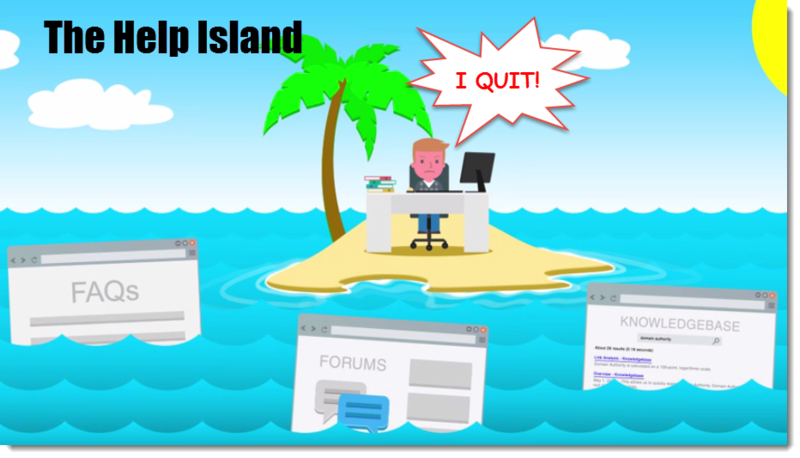 Your customers can't find your knowledge base because it's hidden off on a help island, far away from what they are actually trying to accomplish. Even if they can find it, they don't know what words to search for; they have to wade through dozens of articles to find what they need, if ever. Visitors give up long before this, suffering yet another frustrating encounter with technology. Things aren't much better for you. Because your visitors can’t find your content, your live chat agents answer the same questions over and over. Most of your support tickets are handled by a link to a knowledge base article. And you’re constantly struggling to remember which articles are out of date as your site changes. How can you provide a magical self-service experience for your site visitors? As a CTO, I can’t help but think of this as a classic information retrieval problem. Your visitor has a question in their head. You have a set of answers. How can you map your visitor’s question to the Q&A you’ve written? Text-based search is not the answer. It forces visitors to know your site’s vocabulary and they’re probably looking for help because they don’t know it. Garbage in, garbage out, as we like to say in computer science. Live chat is not the answer. This just punts on the information retrieval problem by using a human instead of a good algorithm. Your visitors don’t actually want to talk to someone and they especially don’t want to wait to talk. Humans are smart, and they willbe helpful, but they definitely aren’t fast. Browsing is not the answer. Knowledge bases and FAQs assume your visitors will recognize their problem when they see it. They don’t. You can’t imagine the number of times I’ve seen people glance right over the exact question in their head, but not recognize it because it used different words. Tooltips are not the answer. By hard-coding content into your app, you’re guaranteeing that content gets quickly out of date. That, and you’ll be completely ignoring the questions you never imagined your visitors had. Allow visitors to point. Instead of making them describe their problem, let them just point to it on their screen. This way, visitors don’t have to know your site’s terminology to find help. Search instead of pin. By searching, content can appear on your site wherever it’s relevant, rather than only the places where you decide to put it. Better yet, as your site's layout and design changes, search still works with zero effort. Tooltips and other hard-coded content quickly break. Publish questions using your visitors' language, not yours. This is key. Your visitors need to recognize that a question relates to their problem. By letting visitors point for help, you create a mapping between the words your visitors have in their head and the words you have on your site. AnswerDash does all of these things. You write one set of Q&A. You decide which pages this Q&A appear on. As your site changes, its point and search approach to help retrieval means your self-service keeps working as your site changes. Best of all, you never answer the same question twice. Magic, huh?